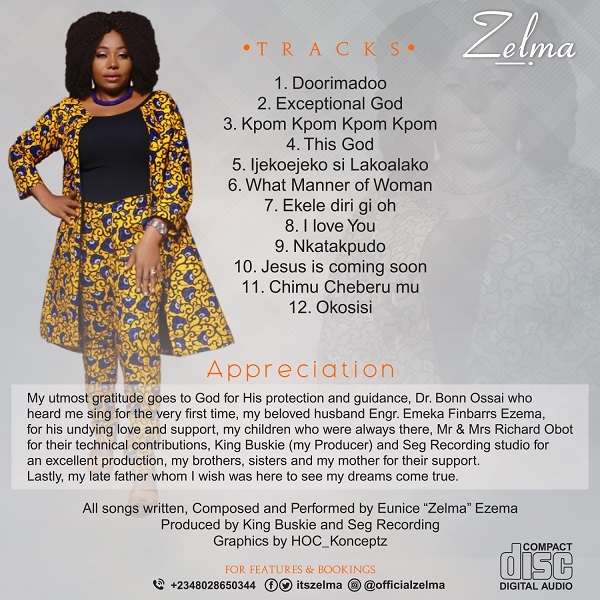 Chidiebere Eunice Ezema better known as Zelma, is a Nigerian singer born in Onitsha, Anambra State, Eastern Nigeria. Zelma says: “Music has always been my passion. I started singing from the age of 9. I did my first demo recording when I was 16 and also a talent hunt show at lekki -beach Lagos( lekki- sunsplash)at the age of 18. Surprisingly I performed on the same platform with Lagbaja ,the late raskimono and some other big artists. My parents/brothers and sisters were very supportive and encouraged me to pursue my musical career. I never knew how good I was until the very next day when the vendor brought our morning paper(champion newspaper) surprisingly I was talked about as being the best and then the reality of my music dawned on me. The new album, is made up of 12 exceptional tracks carefully put together by Zelma. Off the album, here are two tracks for your download and listening pleasure. The album can be streamed and bought on most online platforms soon and also found in your local stores.